There is water, water everywhere on these Brazil tours where you’ll relax, be energized and awed by some of the country’s most visually stunning sights. The Brazil travel kicks off with three memorable days in Rio de Janeiro, where you’ll experience the grandeur and glamour that make it one of the world’s greatest cities, visiting its most famous landmarks by day and living it up by night in this cosmopolitan destination. With waves rivaling the Hawaiian Islands, the paradise of Florianopolis is an exotic region on the south coast with a laid-back beach culture and Rio-style nightlife surrounded by subtropical forests, making it a popular international vacation spot for Brazil adventure travelers. Here visitors enjoy surfing, hiking and white water rafting with plenty of time to enjoy the white-sand beaches and a choice of calm warm waters or wild waves. The most awe-inspiring waters are saved for last when you visit one of the top sights in all of South America, Iguaçu Falls. The panorama of these 275 magnificent waterfalls surrounded by lush subtropical rainforest is a photographer’s dream, making a fitting finale to the magical places in this Brazil travel. Today, upon arrival, you will be transferred to your hotel where you can drop off your luggage then continue on with your guide for a one-hour walking tour of your new neighborhood. Active Rio Options - For those who desire a more active itinerary option, we offer Active Rio which substitutes walking and hiking during some segments of your Rio de Janeiro tours. A: We offer both active and cultural tours that visit the incomparable Rio de Janeiro, the Amazon, massive waterfalls, the epicenter of Afro-Brazilian culture, and seemingly endless beaches. These itineraries vary in length and level of accommodation. Our Adventure Travel Coordinators would be happy to chat with you to help you find the itinerary that best meets your needs and interests. A: Yes! We are happy to put together a custom Brazil tour for you if our current itineraries are not quite what you are looking for. We can also add extensions onto any of our existing tours. Q: When is the best time to go to Brazil? A: Brazil is a year-round destination. High season runs from December through April, which is also generally the warmest time of year. A: You will find several distinct climates in Brazil, depending on where you travel. Along Brazil’s northeastern coast, temperatures are mild year-round, rarely dipping below 75F. The summer rains, usually lasting three to four months, arrive as early as April, consisting mostly of quick showers. Rio de Janeiro is pleasant year-round, with slightly cooler winters than summers. Rio’s rainy season begins as late as October, though rains can occur anytime of the year. You will experience the most temperature variation between seasons in the south, with hot humid summers from December to March and cooler temperatures during winter, which runs from June to August. In the country’s interior, such as the Pantanal and Bonito, the hottest, wettest weather occurs from December to March. Q: What is a typical day like on a Brazil tour? A: A typical day in Brazil will vary from tour to tour, but you can generally expect to start your excursions right after breakfast, with a full day of scheduled activities or sightseeing. A lunch break is included and you’ll retire to your accommodations in the late afternoon, with evenings free. Q: How physically fit do I need to be to enjoy a trip to Brazil? A: Our Brazil trips vary in level of activity, so the requirements differ based on itinerary. Please check our physical ratings for each itinerary to see what may be required of you when assessing your ability to enjoy a trip. If you have any specific questions, please contact your Adventure Travel Coordinator. We have personal experience with these activities and can help you decide whether a trip is right for you. Q: How much time do we need to visit Brazil? 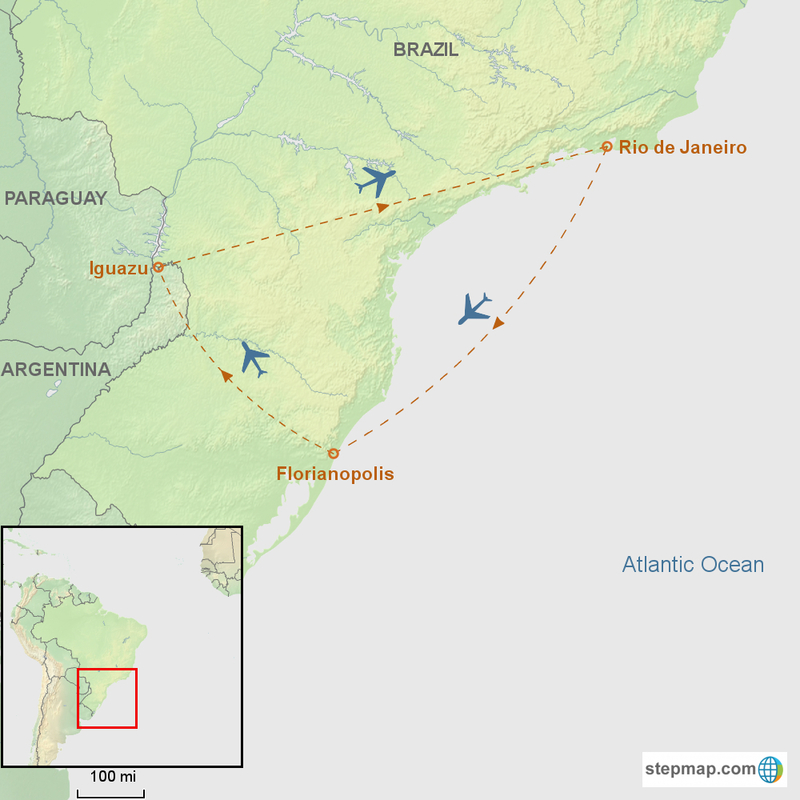 A: Most of our Brazil trips are between one and two weeks, depending on how much of the country you would like to see. A: For the best guide availability and selection in hotels, we recommend booking three to six months in advance. December through April are especially popular times for Brazil travel, so more advance planning is ideal. For the Christmas holiday season, Carnival and the week prior to Easter, we recommend booking a year in advance. A: In major cities we offer a variety of hotels including boutique properties and larger business-style hotels. Throughout the rest of the country we work with a combination of pousadas, small traditional hotels, and remote lodges. The majority of the properties are family-run or locally owned. All of our accommodations are clean and comfortable, with private bathrooms and hot water. We offer basic or luxury options in many locations, depending on taste and budget. A: Eight travelers is the maximum for our Brazil trips, but the majority of our departures are private. Q: Do I need a visa to enter Brazil? A: Yes, Brazil requires tourist visas for travelers from most nations. Please contact your nearest Brazilian consulate for more information or a third-party visa specialist such as VisaHQ.